Because of the graduation season, we have been talking about the orchids we bring in from Thailand and Hawaii to make leis. In our weekly shipments from Hawaii, we also order a wonderful selection of tropical flowers, some of which you can see in the pictures on the Flower Arrangements page. Island Home and Garden is the only store in Santa Cruz with such a wide variety of these flowers, and their main asset is that they are very long lasting. 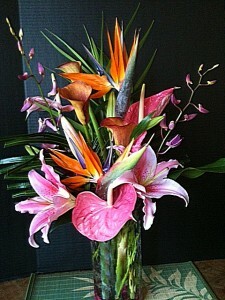 The anthuriums in particular, can last up to 3 weeks, and they come in all sizes and colors. Another notable feature of the tropical flowers are the intense colors: reds, pinks, greens, purples, and oranges – which make lively and memorable flower arrangements. Come in to Island Home and Garden and browse our “island” of fresh flowers, which displays ginger, halekonia, birds of paradise, tropic fleur, etc., and a wonderful selection of tropical foliage.